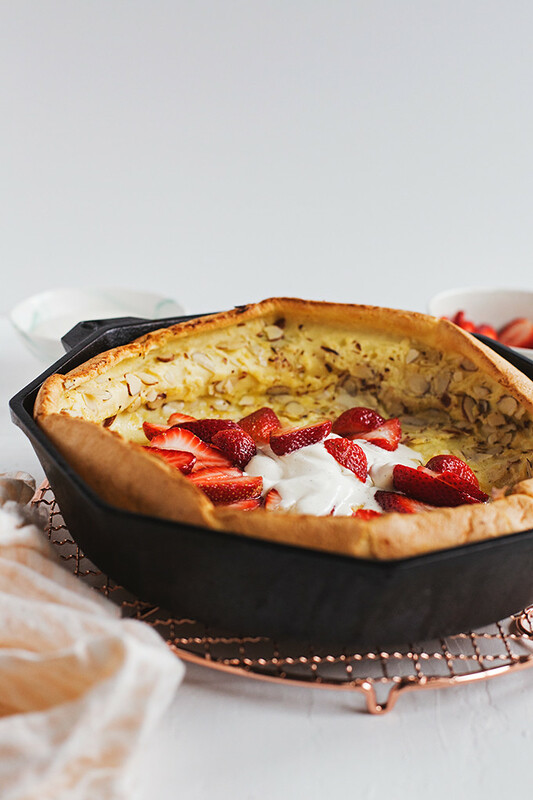 The very best thing about a Dutch baby, besides those impossibly crisp edges and custardy center, is that it is probably the most foolproof-yet-impressive weekend brunch item you can make. Which means it’s perfect for the upcoming Easter holiday, since we all need a brunch dish in our arsenal that impresses our family members while leaving us looking graceful and effortless in the kitchen–or at least me, who usually looks food-splattered and frizzy-haired. 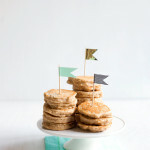 The batter is just a handful of ingredients that get dumped into a blender, or a bowl, and whirled together until smooth. Then, you pour it into a hot skillet with melted butter and let it bake. That’s it. 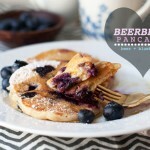 Somehow from a thin and humble batter you end up with one stunner of a pancake, zero flipping involved. 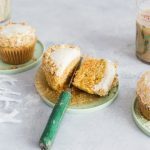 At its simplest, the topping can be a squeeze of lemon juice and a sprinkle of sugar (seriously one of my favorite toppings) or a pour of maple syrup. If you want to get fancy, stir the scrapings from a vanilla bean into a tub of crème fraîche and lightly macerate some strawberries and you’ll have something somehow even more stunning than puffed, golden crown of a pancake–and honestly, it just sounds fancy but takes very little effort which is what weekends mornings are all about, amirite? Crunchy almonds sprinkled over the batter lends some crunchy texture and toasty flavor to this oven baked pancake. Preheat the oven to 425°F. Place a cast iron skillet or pie pan in the oven while it preheats. Once the oven is hot, add the butter to the pan and allow it to melt in the oven. In a blender, or using a hand mixer, blend the eggs, flour, milk, almond extract, and pinch of salt until completely smooth and combined. Don't bother whipping it, just make sure it's lump free and well combined. Swirl the butter to coat the pan and pour in the batter on top. Sprinkle the batter with the sliced almonds and return to the oven. Bake for 18 minutes, until puffed and golden. 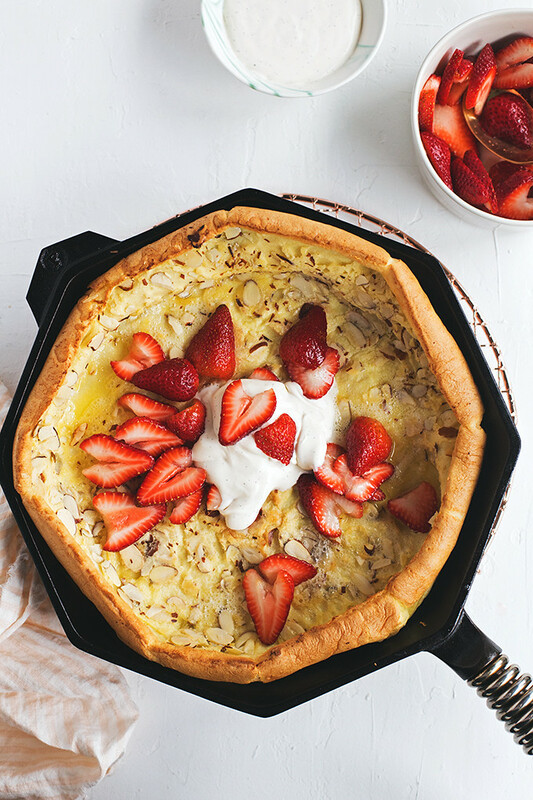 While the dutch baby bakes, stir the seeds from a vanilla bean and 1 tablespoon of sugar into the crème fraîche. In a bowl, toss the strawberries with the remaining sugar. 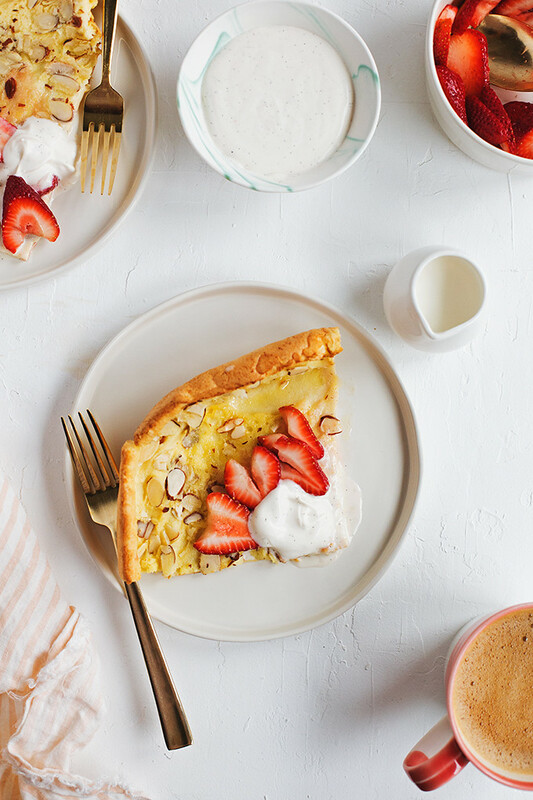 Serve the baked dutch baby with the vanilla bean crème fraîche and sugared strawberries. ALMONDS!?! Such an awesome addition! 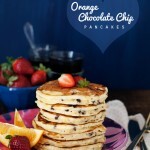 This flavour has all the right stuff keeping breakfast fabulous. Yum! Oh my gosh I LOVE DUTCH BABIES! Soooo into this basically dessert for breakfast vibe. Gorgeous photos! Perfect edges on this dutch baby if you ask me. 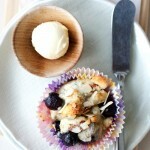 And vanilla bean creme fraiche = freaking out over here I’m totally in love with that idea. It’s SO GOOD! Thanks, Erica! 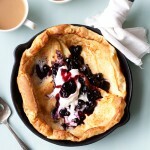 That’s it, this looks so incredible, I’ve got to try a dutch baby! It’s been on my list forever and yet I’ve never had one. Thanks for the inspiration Cindy! This (dutch) baby is tooootallly speaking to me. So good!!! How big was your pan? It’s a 12-inch pan, but I’ve also used a 10-inch. Sorry for the delayed reply! That pan looks so different with the straight edges. Where is it from! ?